Christian Education is scheduled for children from October to May. (But it really goes on all year, and most of it happens outside of church, at home and on the playground and in the supermarkets and stores!). Children begin education to Christ in church as early in life as their parents desire. The Growing in Faith page of this site provides online resources renewed from month to month for parents and families to nourish faith at home. Learning at home is still the most lasting learning that children experience. Sunday School meetings to invite the kids' questions on God, Christ, the Spirit, the Church, and what it means to live as a disciple of Christ take place following the 10 am Eucharist on the second and third Sundays of the month from October through May. The active participation of parents and grandparents in making all this good happen is most warmly encouraged and accepted. Call the Church Office to see how you can help (and gain much in the effort). Our parish youth group meets one Sunday evening each month beginning in September for fun, service, and learning. If you are from 12 to 18 years of age, you'll love this group. For more information, contact the Parish Office and we will put you in touch with Nicole Fanelli-Burke who guides our youth group. Throughout the year opportunities for learning in Scripture, Church tradition, and spirituality are offered. Saint Anselm's Reads is our parish Book Club. We read a book online and in person throughout the major seasons of the church year. Upcoming educational series are advertised in the weekly Parish News and in the Friday e-newsletter, as well as on the bulletin board in the Great Hall. Parishioners and friends are always welcome! At Saint Anselm's Academy, we foster each child's intellectual, social-emotional and physical development in a play based environment. 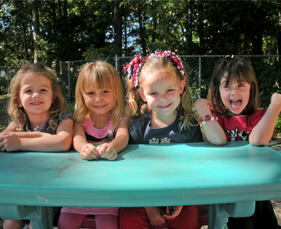 To learn more about the Academy's learning and care for children from infancy to 4 years old, as well program hours from 6:30 am to 5:45 pm, visit www.stanselmsacademy.org. You can contact Academy Director Dani O'Connor directly at 631.744.2560 and by email at doconnor@stanselmsofshoreham.org.